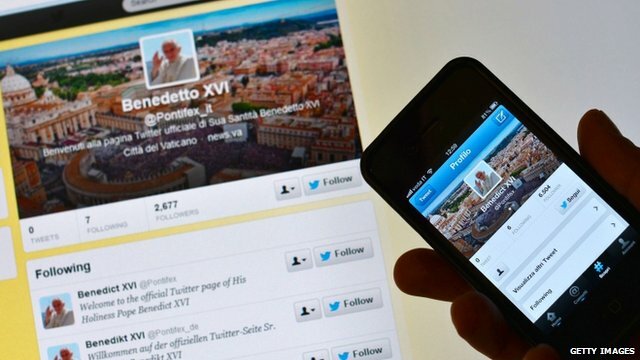 Will the Pope's tweets be infallible? 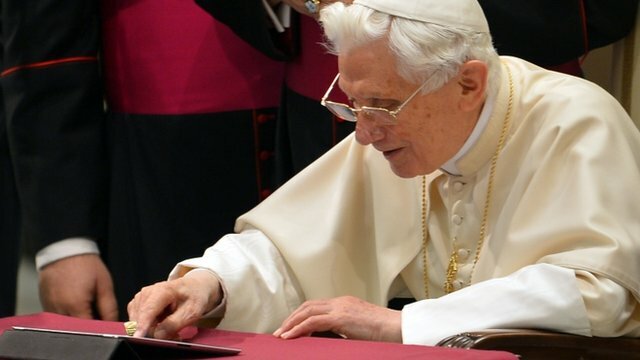 Pope Benedict XVI has sent his first much-anticipated Twitter message using his personal account. The Pope was shown pressing a button on an iPad tablet at the Vatican. The message read: "Dear friends, I am pleased to get in touch with you through Twitter. Thank you for your generous response. I bless all of you from my heart." A spokesman said earlier the pontiff would "reach out to everyone" with accounts in eight languages. After his introductory tweet on Wednesday, Benedict posted two follow-up messages. This venture into the Twittersphere is meant to reflect the Vatican's commitment to being part of the debate in cyberspace. People are being asked to put questions to the Pope. And among those already posted, some are funny, and many others crude or silly. But some are sincere. As one Vatican insider put: "The Pope's job description is to spread the word, and Twitter is a good way of doing that." And being limited to the use of just 140 characters should not be too much of a hindrance. The Christian message has often been at its most powerful when it's been at its most succinct. Think of the Ten Commandments; "Thou shalt not kill" - just 16 characters. They focused on promoting the Church's recently launched Year of Faith - an initiative intended to re-energise Catholicism. "How can we celebrate the Year of Faith better in our daily lives?" the pontiff asked. And he answered: "By speaking with Jesus in prayer, listening to what he tells you in the Gospel and looking for him in those in need." Benedict's English account already has more than 700,000 followers and is growing fast. Last year, the Pope sent his first tweet from a Vatican account to launch the Holy See's news information portal. The leader of the world's 1.2 billion or so Roman Catholics is expected to sign off, rather than write, each individual tweet himself. The Pope's tweets are also expected to highlight messages from his weekly general audience, Sunday blessings and homilies on key Church holidays as well as papal reaction to world events.